Hillary is so old that Connor MacLeod, the immortal Scottish swordsman known as the Highlander, challenged her to a sword fight for the Prize. Hillary is so old that when Jesus said throw the first stone, she threw it. What a lot of people don't realize is that after Hillary Clinton was hospitalized for brain damage back in December 2012, her surgical team had to implant a steel plate in her head. Although the steel plate allowed her to return to the campaign trail, if she is in the same room with a microwave oven she'll pee herself and forget how to talk for a couple of hours. Mirror, mirror, on the wall, who's the oldest of them all? Hillary is so old that Sir Edmund Hillary was named after her. Hillary is so old that she can't get an organ transplant under Obamacare. They no longer make her parts. Damn it, Jim, I'm a doctor, not an archaeologist! Hillary is so old that her gallstones have fossilized. Now that Lindsey Graham has dropped out of the race, Hillary Clinton is the only Democrat woman still running for President. Donald Trump boasted "I could “shoot someone and not lose voters.” Maybe, Donald, but only if that person was ___________ ___________. If Hillary is elected, she won’t have to get new White House silverware. She still has the entire set she took with her when Bill left office. For many years the National Park Service has recognized the General Sherman giant sequoia as the oldest living tree on Earth. However, earlier this month a team of  researchers identified an even more ancient one deep in the Sequoia National Forest. They've named it Hillary Clinton. 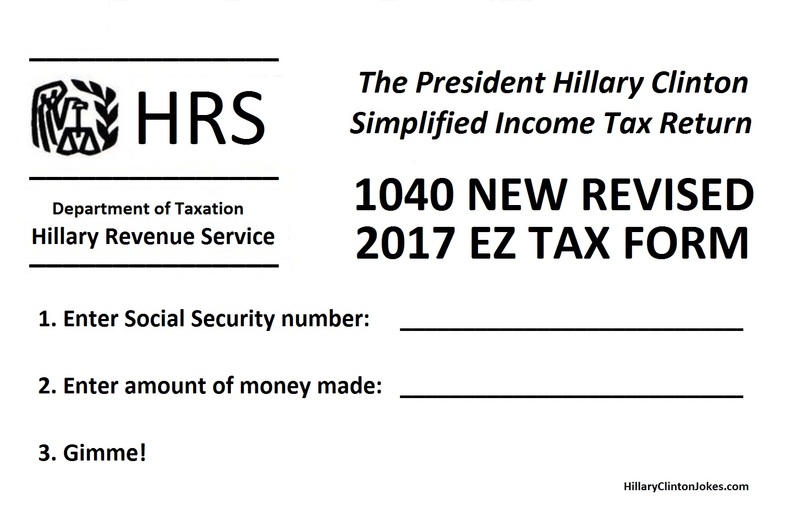 Hillary Clinton's new Income Tax form eliminates any possible confusion about what you owe. 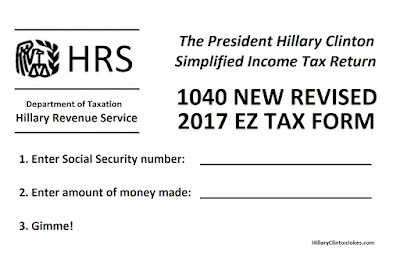 Thanks to Hillary, you'll be able to complete your federal income tax return in just three easy steps. 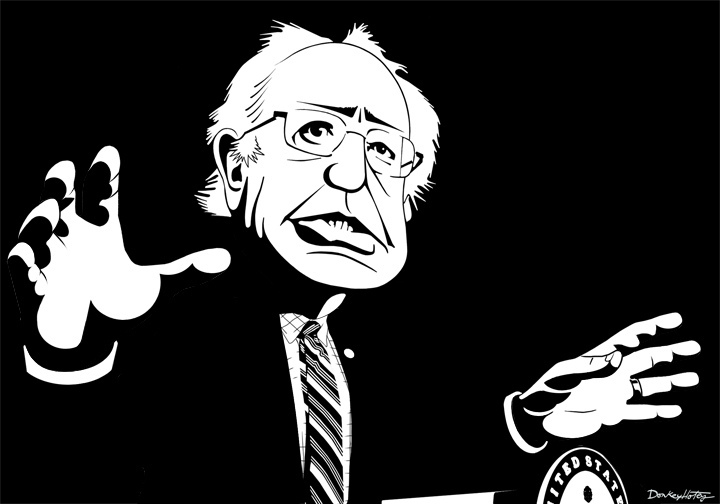 Hillary is spreading a nasty rumor about Bernie Sanders. She claims that he once had a job and worked for a living. 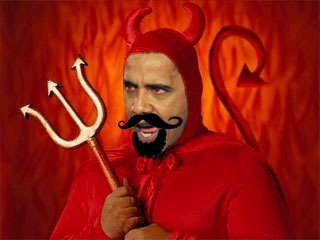 "Powerball began paying out the $1.6 Billion prize to three winning tickets. Odds of winning were 300 million to 1 -- or about the same odds as Hillary Ramrod'm telling the truth about Benghazi. Or anything else for that matter." Tip of the hat to Freedom Memes. Q. 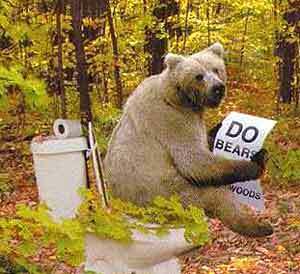 If Hillary Clinton falls in the forest, and there's nobody around to hear, does she make a sound? A. I don't know. Let's find out. Before the last Democrat Debate, both Hillary and Bernie turned off their hearing aids. Jim Treacher ✘ @jtLOL tweeted that the Democrat Debate was so boring that Hillary and Bernie "should decide the nomination with a HoverRound race." Hillary has fallen so far in the polls that she can't get up! Cruz and Rubio have announced that they want to hold a Convention of the States so that they can rewrite the United States Constitution, but Hillary opposes the idea. She remembers how the last Constitutional convention turned out, and she didn't like it one little bit. How bad was last night's debate? Hillary got beat worse than Ronda Rousey. Hillary says she'll won't debate Bernie again unless she gets to wear a boxing helmet. Bernie Sanders laid such ferocious beating on Hillary Clinton in last night's debate that he should face elder abuse charges. Did you ever wonder what Hillary will do after she loses the presidential election? Please don't call Hillary Clinton a liar. She's simply a professional pseudologist. In a widely reported attempt to censor stand-up skits recorded at the Laugh Factory comedy club, the Clinton campaign called club owner Jamie Masada and demanded that he take down the comedy video and give them the names and phone numbers of the comedians appearing in the video. The Laugh Factory has more information and video footage about the scandal on its website. "We must laugh at Hillary Clinton to avoid crying for ourselves." 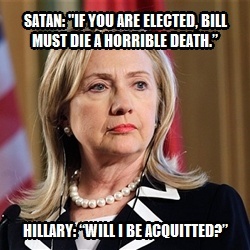 Post your Hillary Clinton joke here! Do you have a great Hillary Clinton joke?